An example of why I value EWG Skin Deep database. It’s not perfect, but has helped me learn a LOT about ingredients of concern. Grapefruit Seed Extract (GSE)- sounds harmless, right? It comes from fruit. I never would’ve thought twice about being alarmed when seeing it on an ingredient label, except in the process of looking things up in EWG I noticed they rate it a 6 which is very high… Sharing a couple of links below for those interested to learn more about why it receives this rating. Those critical of EWG usually say the organization is paid off to give good ratings to certain companies. My response: Don’t browse by company, browse by ingredients you’re interested in… It’s not a final answer on anything, but as I said, a great starting point, and I like that they like to usually hundreds of PubMed studies to back up their numbers. What is the ‘safest’ Disposable Baby Wipe? Unfortunately I cannot recommend any as they all have very questionable ingredients in them and they all make me uncomfortable to put on someone, especially a sensitive, soft skinned babe. 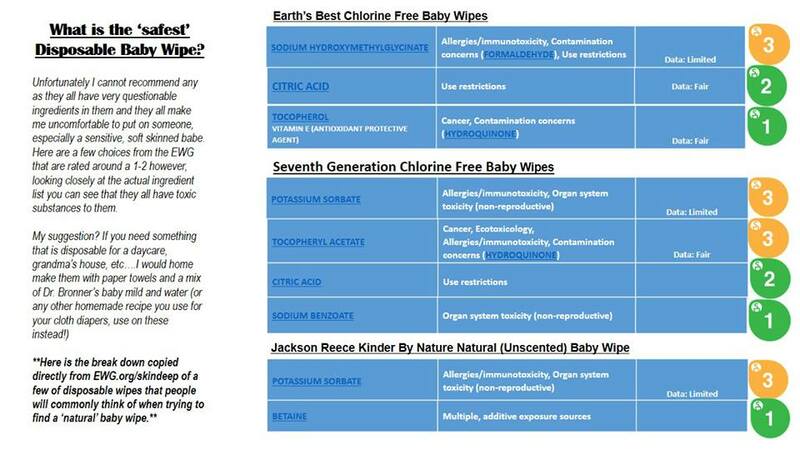 Here are a few choices from the EWG that are rated around a 1-2 however, looking closely at the actual ingredient list you can see that they all have toxic substances to them. With so many products out there claiming to be ‘natural’ and ‘safe’, how do we know which are really so? Everything nowadays seems to carry a label promising good and wholesome ingredients for our families however, it is sad to say that many of these are simply advertising ploys to get you to buy their product. Goldfish and sugar cereals have now become ‘natural’ and all baby shampoos are now ‘non-toxic’. Since when? Since the green and healthy living movement became very profitable and the Food and Drug Administration put lax requirements on what can be considered ‘safe’, that’s when. Let’s explore what the requirements are for being natural, non-toxic, etc. As of April 2012, the FDA have not developed a description for use of the term natural or its derivatives. On their website they say that they do prefer that a food that contains added color, artificial flavors, and synthetic substances not be labeled as natural. (FDA.gov, 2012) This is obviously not enforced with a closeness as many children’s favorite snacks such as Goldfish Snack Crackers has the label Natural on the front and contains unnatural ingredients such as GMO’s (found in its canola, sunflower, and soybean oils) and MSG (found in its autolyzed yeast). Both of which are toxic for the body. The term ‘natural’ should be second guessed by looking at the label on the side or back of the package. Remember, the FDA does NOT have a regulation for this therefore, anything can quite literally technically have the term natural. 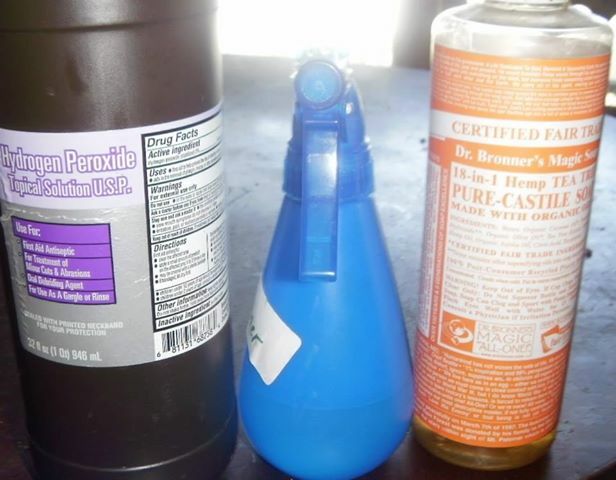 When something is FREE from any toxins, they can be considered toxin-free. It is not the same thing as being non-toxic. 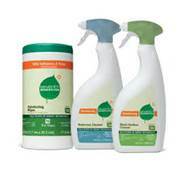 (You will find the rare company that says they are non-toxic and are in fact toxin free). It can be hard to differentiate the difference especially when a company so heavily advertises as being safe but it is something that is solely found by consumer awareness. Many people who have phones or computers can look up the Environmental Working Group’s website (listed at the bottom of this article) and most often the brand is in their database with ingredients broken down as to whether or not they are harmful or not for you. If an item cannot be found, you can search by individual ingredient. A very valuable resources when trying to rid your life of toxic substances. There are several levels of being organic and it’s best to know which is what so that you may choose the best option for your family. According to the USDA’s national organic standards, products labeled as “100 percent organic” must contain only organically produced ingredients. Products containing 100% organic ingredients may display the USDA Organic seal and the certifier’s logo, and must identify the certifying agent. To be labeled as “organic,” 95% of the ingredients must be organically grown and the remaining 5% may be non-organic agricultural ingredients or synthetic substances that have been approved for use in organics by the USDA. These products are also allowed to display the USDA organic seal and certifier’s logo, and must identify the certifying agent. Food products labeled as “made with organic ingredients” must be made with at least 70% organic ingredients. The remaining 30% may be agricultural products that are not produced according to the organic standards, and the ingredients list must clearly specify which products are organic and which are conventional. 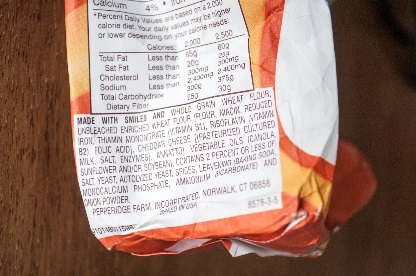 Non-organically produced agricultural ingredients may be processed with synthetics, but any non-agricultural ingredients appearing in the ingredients list of a “made with organic ingredients” product must be approved for use in organics by the USDA. These products must identify the certifying agent and may display the certifier’s logo on the back panel, but may not display the USDA organic seal. All products using the USDA organic seal (food, personal care products, clothing, etc.) are held to the same standards (a manufacturer using the USDA organic seal on a product that does not qualify would be in violation of federal law, and could be subject to civil penalties). Unfortunately, the USDA does not have authority over the use of the term “organic” in a brand name, and some companies are taking advantage of this loophole. (greenerchoices.org, 2013). This is why when people think they are eating wholesome food or buying safe products they aren’t. Companies that do this should be ashamed. There are many other ways that companies try to deceive you by way of advertisement, into thinking their product is completely safe for you and your family. Below are listed a few common things to look for when looking for items that are truly safe, so to not get caught up in judging a product by first glance. When people think of natural, they tend to think of nature…leaves, trees, green, brown, etc. Advertisers know this and try to make things they are trying to sell off as natural, have nature-like packaging. I see this in baby wipes very often. It will have a bunch of leaves on it, the package will be green and have a little bee on the front (and hey it even says Fragrance-free and hypoallergenic) and you think you have found something natural. Sometimes it even will say Natural on the front. Unfortunately upon taking a closer look, you will find things that are horrible for your body and health. These are the items that are general marked up in price because you are buying something ‘natural’ even though it is really far from the truth. The last common thing I see on packaging on either food or products, are catch-phrases that companies make people think they are buying something natural and safe when in fact it is advertisement at its best. A few catch phrases to look out for: Free & Clear (does not mean its free and clear from all toxins), Green (doesn’t mean it’s good for you or the environment), Hypoallergenic (a lot of people are still allergic to these items because of other bad for you ingredients present in them), and sadly the term eco-friendly often gets misused and I find it most often on a bad for you product that happens to be in a made from recycled products package. I know this was a long article but there are some very common things people should be aware of in order to be informed buyers. There are many, many companies out there that do not care for the well-being of its consumers, only the profit they seek to make by tricking people into thinking they are doing better for their families. Fortunately for us, there are a lot of really great companies that are not greenwashers, they are bonafide, hardworking, honest companies that give forth a toxic free (often organic and handmade) product. Remember, you vote with your dollar and when you know better, you do better. Written by Jolene Marty, Published July 2013. I’ve had Growing Up Wild on my Made in the USA Master list under the shoe category for some time after they were recommended by others, but had not personally owned any items. 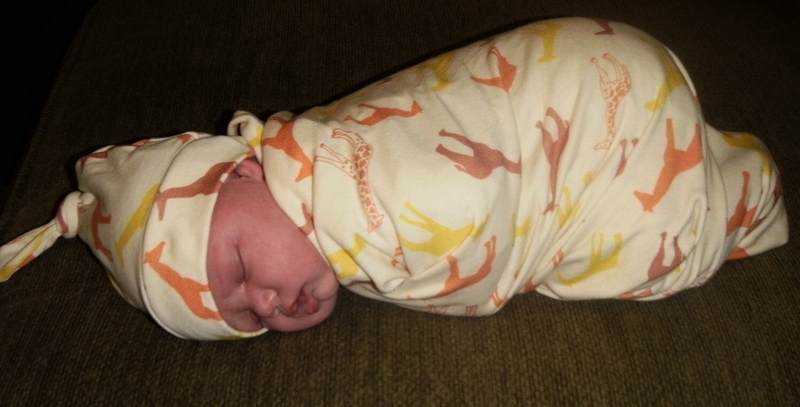 I was so honored to have Kelly offer to make me a matching organic blanket & hat of my choice for my new bundle of joy. Since we didn’t know if we were having a girl or boy (I STRONGLY encourage you to hold off, it was SO exciting not to know), I picked out this gender-neutral print. You may, or may not know that cotton is one of the most heavily-sprayed crops grown in the US. So having this organic cotton blanket & hat as one of the 1st materials to touch my newborns skin made me a very happy Mama, both for my newborns sake & for the environment as well! They are SO incredibly soft and very light-weight, making them perfect for swaddling my July baby (who loves to be swaddled). There are numerous themes & colors available. They can be personalized and are available in newborn & toddler sizes. The hat has plenty of room to grow with my babe, who was 10# at birth- the hat & the blanket will both see many, many months of use. Most of the blankets run $45 themselves, or $55 for the blanket/hat set. What a great item to put on your baby shower registry if you are an expecting Mama! Categories of offerings from her Etsy shop, with several items in each category: Organic bodysuits, organic gift sets (matching onesies/t-shirt & shoe sets), organic shoes (0-18m, absolutely adorable offerings! ), organic hats & blankets, organic teething toys (very cute wooden rings with fabric animals & shapes), toddler t-shirts, organic burp cloths, non-organic shoes (0-18m), sale & supplies, dresses. Where she gets her fabrics: “The organic knit fabric for my swaddle blankets and hats is produced in the USA and GOTS certified. I buy most of my printed fabrics through a WAHM in Oregon (I like to pay it forward so people buying from me can actually help support two families), the printed fabrics are nearly all made in India though. The few fabrics that I don’t buy through that WAHM (cedarhousefabrics.com) are purchased directly from Jennifer at Monaluna (a US based company) as I buy from her by the bolt. My plain colored knit prints and the organic sweatshirt fleece that line many of my shoes are grown and milled in the USA. I wish more fabrics were 100% made in the USA. I always have my eyes open but currently the fabrics I buy through Near Sea Naturals are the only ones that meet my quality standards, are GOTS certified and made in the USA.” I have asked numerous clothing/cloth product manufacturers where they get their fabric & can tell you most of them say “it’s too expensive to get US-made fabric”. I feel Kelly is going out of her way to support Made in the US, and I TRULY appreciate her effort!! THANK YOU Kelly for sharing your beautiful creations with me! And thanks for making great, safe, environmentally-friendly products using US-sourced materials as much as possible. Keep up the great work!! Please visit her Etsy shop & Facebook page to browse her beautiful product offerings! Spend $75 or more and use coupon code GONATURAL to save 15%! My family is all happily adjusting to life with our new little love. Big brother is soooo full of kisses for Althea, and I’m adoring having two little snugglers ♥ I had several people comment that they were curious about my acupuncture experience, so I thought I’d share the gist of it. I’ve never had acupuncture before. 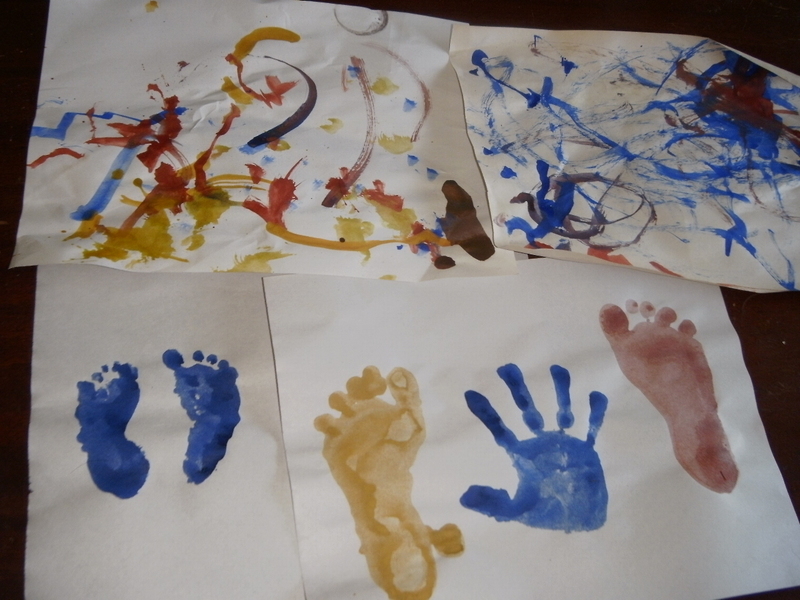 It was suggested to me from a Mama who had a session when she was overdue, went home, took a nap & woke up in labor. So I thought it was worth a try. I was 8 days overdue. A foot/leg massage had brought on contractions a few days prior & I really felt I was on the verge of labor, just needed a little nudge. I had a vision of huge needles in my mind for some reason, and when I saw how tiny the needles were I relaxed greatly 🙂 They are about 2″ long and very flimsy, wire-like. I went in at noon, she had me lay on my side & inserted a total of 10 needles in my tailbone, inner ankle & wrists. She left for 15 min while I laid on my side listening to Gregorian chants & feeling an awesome cool breeze come in through the open window. She came back, turned the needles a bit, left for another 15 min while I laid there & relaxed some more, visualizing white light coming in through the top of my head & out the needles. She came back, took them out & I was done. Other than a tiny little poke when she inserted them I didn’t feel a thing, other than relaxed. I went to the food co-op & did one last shopping run as I really felt it would be my last run for awhile, went home & laid on the couch with my toddler for an hour or so, and started feeling a contraction here & there within 2 hours of the appt. Within 4 hours of leaving her office I was having contractions 5 min apart, and within 10 hours of the appt. I delivered my 10# 2 oz. perfect baby girl in 3 pushes. So, that’s my story. Is it possible it’s a complete coincidence & I would’ve gone into labor regardless of the acupuncture? Of course. But I really, really feel it was the little nudge I needed to relax my body & help me welcome Althea into the world. It won’t work for everyone, but she did tell me she has rarely had to do a follow-up, as it almost always works on the 1st try (this is a very small town, so I know she isn’t inducing overdue Mamas daily or anything, but she said she’s had very good success with it). So, I’m a believer… And finally I want to thank all of you for your thoughts, wishes, kind words. It’s awesome connecting with such an awesome community of kind, caring Mamas (& women, I’m sure some of you aren’t mamas).